With the 2018.2 update we continue making Adaxes even better by adding more great features and improving already existing ones. 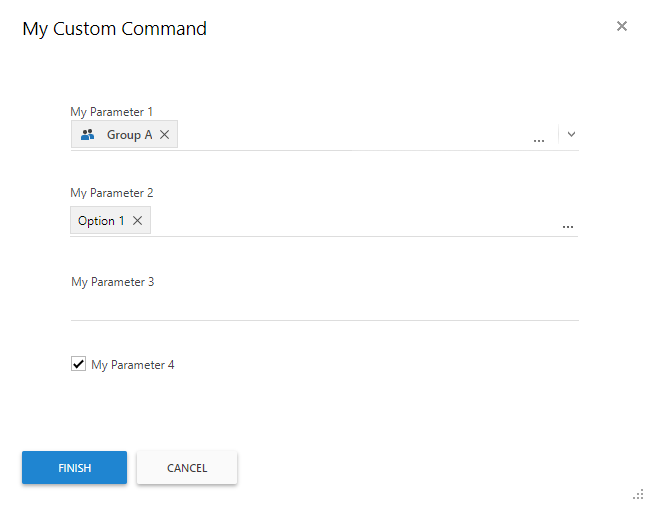 In this release we’re introducing parameters for Custom Commands, adding the possibility to manage individual Office 365 services, polishing up the new Web Interface, improving performance and stability of the product and much more. Here are the main highlights to look for in the latest release. Custom Commands can now have parameters, which allow varying the execution of commands based on user input. This means that you can execute different sets of actions depending on the entered parameter values or use the provided values in the actions. For example, if you have a Custom Command that sends users on vacation, you can ask the initiator to enter a return date that you can then use to set the Out Of Office message, and you can disable the user, if the initiator checks the respective checkbox. When configuring Web Interface actions that execute Custom Commands with parameters, you can simplify the execution process for the users by overriding default parameter values and either hiding certain parameters from users or showing them in read-only format. Adaxes 2018.2 introduces significant improvements for Office 365 management. 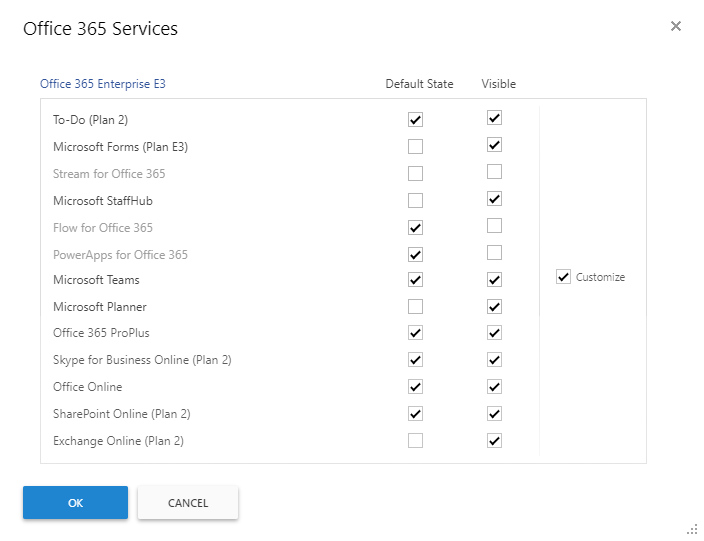 It is now possible to enable or disable individual Office 365 services in the Web Interface and Administration Console. The Web Interface also allows you to configure exactly which services can be viewed and edited. Individual services can also be set in Business Rules, Scheduled Tasks and Custom Commands. 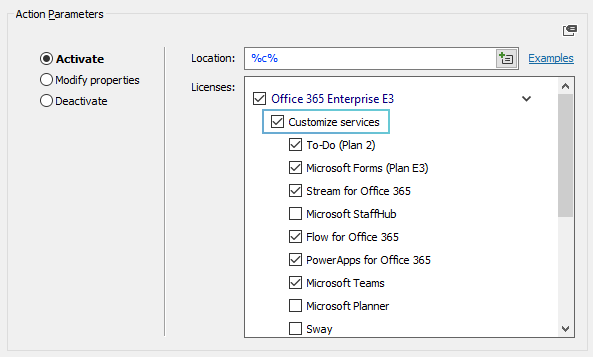 So, for example, when provisioning a new user, you can enable different sets of Office 365 services depending on the user’s department or any other criteria. 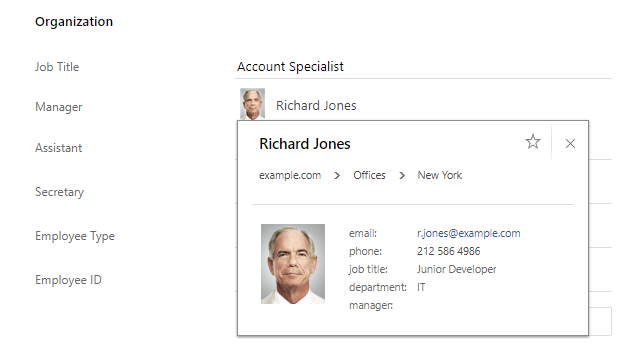 You can specify custom display names for Office 365 services to make them more user-friendly. This can be important if you allow non-technical staff, like managers or HR, to manage Office 365 properties of users. Adaxes now provides an option to display last sync time in the Web Interface, which shows the last time on-prem user account was synced with Office 365 via AAD Connect/DirSync. Adaxes does no longer need Azure PowerShell module to be installed on the same machine with the Adaxes Service to work with Office 365. The performance when working with Office 365 is now significantly improved, especially for environments that have multiple O365 tenants. Any text property can now be viewed and edited as a multi-lined property in the Web Interface. You can now specify default multi-lined values for text properties using Property Patterns. 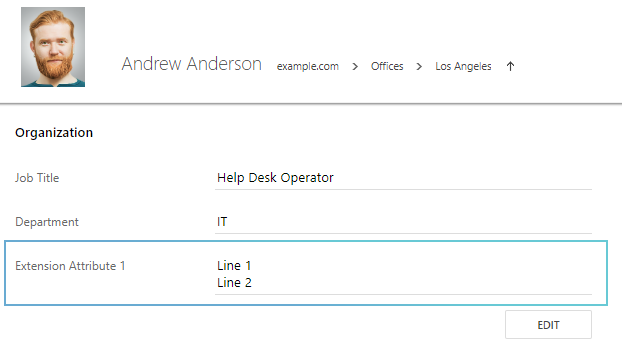 You can also enter multi-lined property values for text properties using the Update Object action in Business Rules, Scheduled Tasks and Custom Commands. 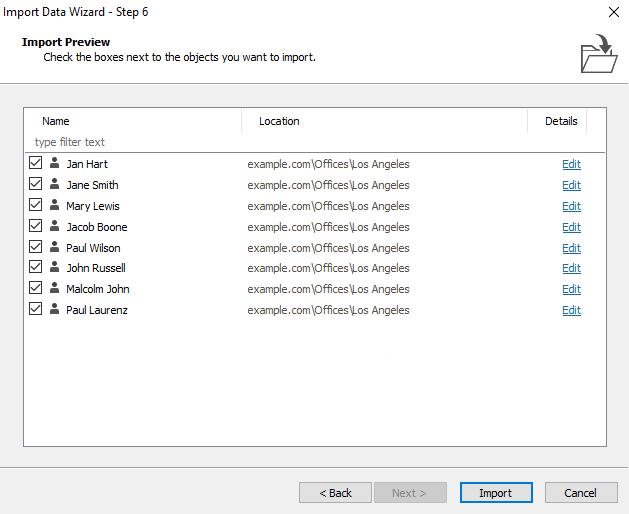 When importing objects via Adaxes, it now displays a detailed Import Preview showing all the objects that are about to be imported in a user-friendly form. There you can review them, select which objects you want to be imported and introduce final edits before executing the import operation. If there are any errors during the import process, Adaxes takes you back to the Import Preview where only the objects that need attention are selected. There you can introduce any changes to resolve the problems and finish the import process. Since introducing the new Web Interface in Adaxes 2018.1 we’ve added a bunch of new features and improvements to make the Web UI even better and more convenient to use. Here’s what to expect. 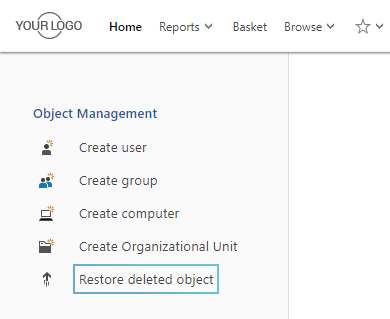 It is now possible for users to restore deleted objects from the Web Interface, as a respective action can now be made available in the Actions panel. When editing properties in the Web Interface on mobile devices, a special keyboard is now used depending on the field you are editing, e.g. URL, email, telephone number, etc. Approval Requests now show the object that the action is executed on. 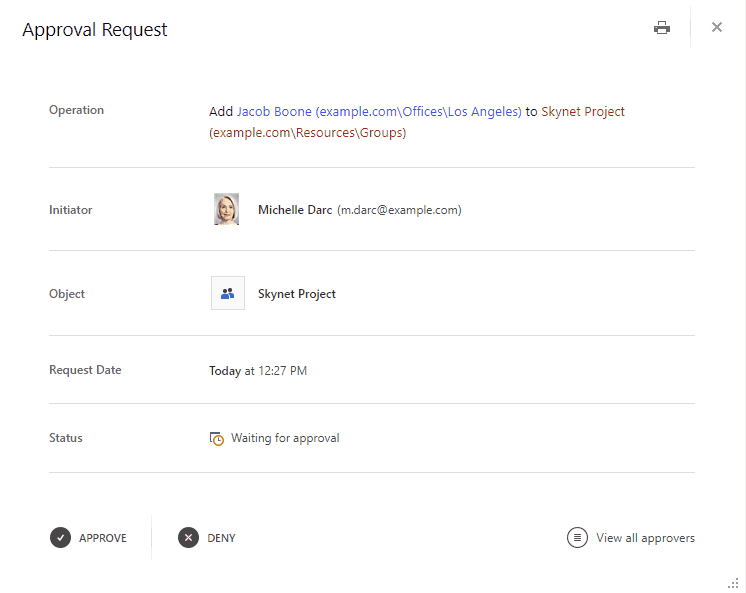 So, for example, if an approval is required to add a user to a group, the approver can see the group, see details about it in a popover and click on it to get more info about the group. Due to multiple requests, we’ve increased the size of the logo displayed on the Sign-In page of Adaxes Web Interface. Auto-logon option can now be enabled for the Web Interface Configurator. The performance of the Quick Search and Object Selection dialogs is significantly improved. Objects shown in property values in the object view, e.g. user in the Manager field, now have popovers. Phone numbers in the Web Interface are now shown as click-to-call links. 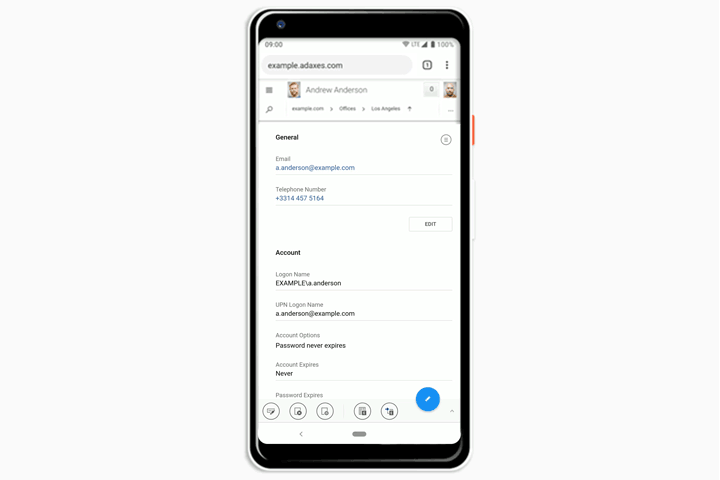 Web Interface can now be used for Password Self-Service from the Windows logon screen, even if the auto-logon option is enabled for the Web UI. With the 2018.2 update we’ve added some important tweaks to also improve Exchange management. Now the Archive mailbox feature can be enabled, disabled and modified in hybrid configurations. 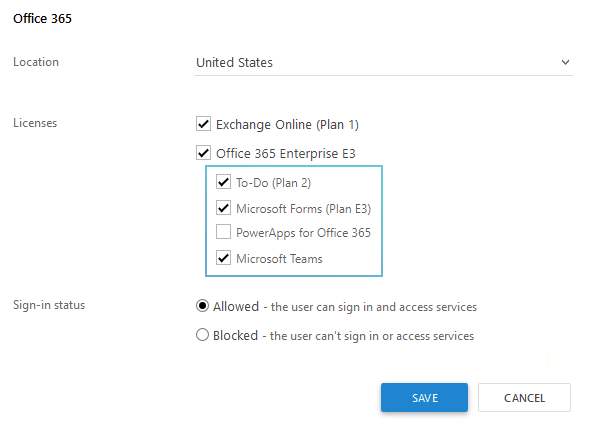 It is now possible to suppress warnings about Exchange properties that are being synced with Office 365 to avoid confusion for non-IT users. 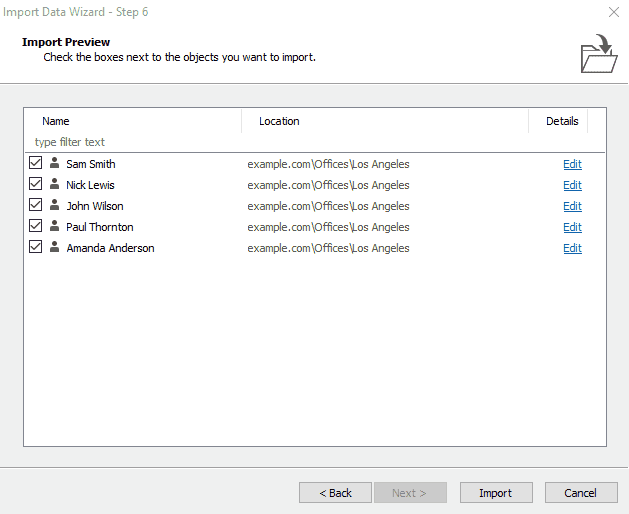 Values for msExchRecipientTypeDetails, msExchRecipientDisplayType and ExchRemoteRecipientType properties are now displayed in user-friendly format in the Web Interface. Establish email address action is now available in Business Rules that are triggered after enabling a user account. Custom descriptions can now be specified for any actions in Business Rules, Scheduled Tasks and Custom Commands. This way you can make sure that non-technical users will see user-friendly descriptions of operations, e.g. when viewing an execution log or in approval requests. When specifying custom descriptions for actions in Business Rules, Scheduled Tasks and Custom Commands, you can now use value references. For example, if a Business Rule updates a user and the operation requires an approval, you can specify a custom description like ‘Update %name%’, so that approvers can see the name of the user the operations is performed on in the operation description of the request. Progress for operations that take a long time is now shown in the Windows task bar. Parameters can now be used in conditions for Reports. E.g. 'If param-Checkbox is checked'. The number of custom attributes provided by Adaxes is now extended, as 10 more text attributes (from CustomAttributeText31 to CustomAttributeText40) and 15 more Boolean attributes (from CustomAttributeBoolean26 to CustomAttributeBoolean40) are added. Adaxes Configuration objects shown in reports can now be added to Basket and Favorites from the report view in the Administration Console. This update brings multiple bug fixes and stability improvements. Fixed an issue with the Edit button not being displayed when the header on the Home page is in self-service mode. Date/time value references can now be specified with a visual editor when providing default values for date/time fields, e.g. Account Expires, on object creation and modification forms. The Edit button on the user profile pictures is no longer displayed to users who are not allowed to edit it. Fixed the issue with the Web Interface name not being translated after changing the language on the Sign-In page. Fixed the Specified method is not supported error that occurred when configuring multi-lined properties in the Forms and Views via the Web Interface Configurator. Fixed the Cannot read property 'settings' of undefined error that occurred when executing an action containing a Custom Command which was previously disabled in the Operations section of the Web Interface Configurator. Fixed the Request parameters are invalid or missing error that occurred when viewing the Child Object section that had the Show only objects that match LDAP filter option enabled. Custom Commands are now sorted by name when displayed in the Web Interface. Fixed the Cannot read property 'isVisible' of undefined error that occurred upon executing a Custom Command which was disabled, and the Web Interface was not reloaded since. Fixed the Object reference not set to an instance of an object error that occurred when executing a Custom Command which had a parameter removed, and the Web Interface was not reloaded since. Fixed the issue with multiple objects selection not working when clicking on objects in a list view with the CTRL key pressed. Fixed the issue with custom text color of report elements not showing up in the Web Interface. Fixed the issue with the date and time picker not being displayed correctly on the object creation and modification forms. Fixed the issues with links in the OOF messages being displayed as plain text in the Exchange Properties section. Fixed the issue with the Account Options values not being preserved when copying user accounts in the Web Interface. Fixed the issue with date/time value references not resolving as default values for Custom Commands parameters that had a read-only option enabled in the Web Interface Configurator. Default values for check box list parameters with the read-only option enabled can no longer be unchecked when executing a Custom Command. Fixed the issue that didn’t allow changing the object specified as a default value for a parameter in the Web Interface Configurator, if the previously specified object has been deleted. 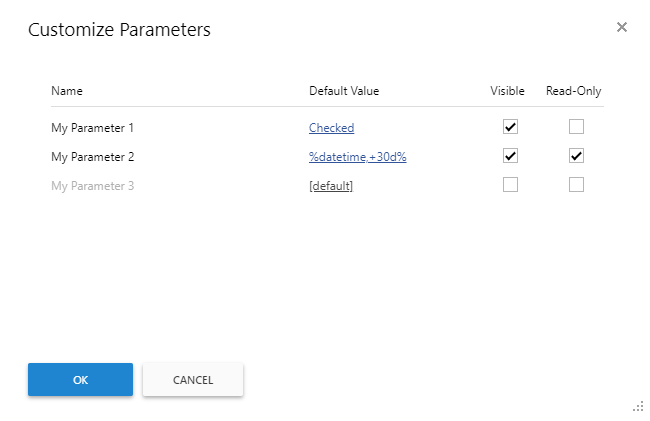 Fixed the The undetermined state is not allowed for the parameter error that occurred when specifying the Undetermined value for a check box parameter with the 3-state option enabled. Fixed the Text for the tooltip has not been provided. Please include text within the mdTooltip element error that occasionally occurred when specifying default values for multiple parameters of the same Custom Command in the Web Interface Configurator. Fixed the issue with value references specified as default values for multiple states of a check box parameter not resolving on certain specific occasions. Fixed occasional crashing of the Administration Console on Windows 7 when trying to send emails from the application. Fixed the issue with adm-ReportName and adm-ReportFile value references not being available in the visual HTML editor for the email body, when scheduling reports in the Administration Console. Fixed an issue with identical log records when a scheduled report is sent to multiple recipients. Fixed the issue with objects that are kept in Basket being displayed as non-exiting after reconnecting to the Adaxes Service. Adaxes 2018.2 Update 2 introduces the following improvements. Adaxes Web Interface is now compliant with Federal Information Processing Standards (FIPS). Enhanced performance of the Web Interface Configurator. Logging is improved with more informative tracing of errors in HTTP requests. Now, when auto-logon is enabled for the Web Interface, correct error message is shown to users who aren’t allowed to log in.